Update: This treadmill has been discontinued. To look for an alternative, you might want to check out our best treadmill page. The Ironman 320T treadmill is the most expensive model in the newly released T series. And as expected, it also has the best features and the most power of all the units in the series. This Ironman model offers 2.5HP continuous duty motor that has a speed range of 0-10 miles per hour and an incline range of 0-12 percent for maximum workout intensity. It also comes with a big 20-inch x 56-inch running surface thus allowing you room for longer strides. The 4 preset, 8 custom, 2 user (create your own hill profile) and 1 heart rate programs give you more variety in your workouts. The OneTouch™ speed and incline controls and the toggle switches make adjusting your workouts as easy as possible. Plus, the heart rate chest strap is perfect for those who love to run in their target heart rate zone. And last but not least, you will also get the 10 year motor warranty, Keys owned brands are known for. (Keys Fitness is the owner and manufacturer of Ironman as well as other treadmill brands) Other warranties include lifetime for frames, 2 years for parts and a year for labor. The biggest weakness of this unit is its quality. Keys Fitness, the manufacturer of Ironman treadmills, is known for producing equipment with below average quality. Warranty: Lifetime on frames, 10 years for motor, 2 years for parts and 1 year for labor. 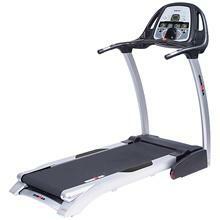 If you plan on buying an Ironman 320T Treadmill, I suggest you order online through Amazon.com. It is currently being sold for just $1,076.88. As an alternative, you can also visit your local Target or Costco outlets and negotiate for the best deal possible.